Home > Sports & Performance > Will Ginseng Improve my Sports Performance? Ginseng is widely marketed as a supplement used to enhance and improve physical performance in sport. As well as being commonly used as an exercise tool, it also purports to increase physical power and improve overall vitality and general health, as well as peak mental alertness. But does it really deliver? Ginseng grows mainly in certain parts of Asia (China and Korea) and Siberia, although it also is available from the United States and Canada. Eleven species of the Panax genus grow, each slow-growing plants that are available year-round with fleshy roots. Please note that “Siberian ginseng” is not really ginseng at all but an almost entirely different plant with completely different roots, which was probably given its ginseng moniker as a way to market it better to unsuspecting western customers. 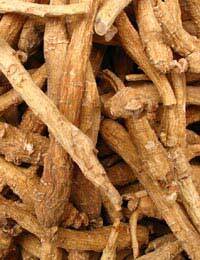 As the ginseng root resembles a tiny man, its name comes from the Chinese words meaning “man-root”. It has been used for more than 3,000 years as both an aphrodisiac and an adaptogen, helping people adapt better physically and mentally to our surrounding environment. More recently, it has become popular as a sports-enhancing supplement, claiming to give people renewed energy, vim and vigour. For athletically-minded people who want to train better and longer, it has become one of the most popular herbal supplements around. Many people take ginseng supplements as a way to improve their sports performance. But the results of a number of clinical studies are mixed at best, and there is no concrete evidence that taking ginseng supplements will result in any sports improvement whatsoever. Despite this, ginseng is still one of the best-selling dietary supplements worldwide. Proponents of ginseng for sport claim it has distinct ergogenic effects, meaning it can increase the overall capacity of our muscles. They say it helps athletes train better and longer by increasing their stamina during competition and producing an all-encompassing anti-fatiguing effect. They also say it has an effect on aerobic exercise, helping improve the body's metabolic and cardiovascular functions. However, most of the studies with positive outcomes did not use either control-groups or placebos; those that did largely showed no improvement when using ginseng in any form to enhance sports performance or exercise. Ginseng is a nutritional herb and is composed of a variety of different substances, including flavonoids, vitamins, enzymes and minerals. Although the potency may vary, there are a myriad of different supplements available, including capsules, powders, teas, energy drinks, nutrition bars, extracts and dried roots. Ginseng has a relatively good safety record. Despite this, it can cause nervousness and excitability in some people for the first few days of taking it. As it has an oestrogen-like effect, pregnant or breastfeeding women should avoid it. Other rare side effects of various types of ginseng include headache, nausea, insomnia, vaginal bleeding and other symptoms. Like with all supplements, even herbal ones, always consult a medical professional before taking any amount of ginseng as it can interfere with prescribed medications or other supplements. If breathing problems, hives or other allergy-related symptom develop, stop taking immediately and call a doctor.